For many Christians, John 3:16 is a favorite passage; it reads, “For God so loved the world that he gave his only Son, so that everyone who believes in him may not perish but may have eternal life.” Many people understand this passage as indicating that belief in the Son is what one must do in order to go to heaven. I think this understanding is narrow and misses some critically important points. The passage notes that “God so loved the world.” If the point of the passage had been that God was only interested in saving from death those who believed in the Son, it would have made no sense to mention that God gave the Son for the benefit of the entire world, including those who are intellectually unable to believe, such as young children, mentally disabled people, and animals. Jesus came to redeem all Creation, not just those who have faith in Jesus. This is why “the creation waits with eager longing for the revealing of the sons of God” (Romans 8:19). The sons of God are those who have faith in God’s redemptive power, and they, being new creations in Christ, will herald a new age where “he will wipe away every tear from their eyes and death shall be no more” (Revelation 21:4). What does “everyone who believes in him may not perish but may have eternal life” mean? Many people think this refers to permanent afterlife. A close look at the word “eternal” offers a broader concept. “Eternal” means unbound by space and time, which describes God’s existence much better than human existence, since human lives inexorably head towards death. I think we may experience eternal life when we are perfectly connected to God, which comes from aligning ourselves with God’s boundless love for all Creation. I think we gain further insight from Buddhism, which I regard as a philosophy, not as a religion, and consequently I do not see Buddhism as competing with Christianity. I think the above notion of “eternal” accords with the state of mind that the Buddhists call “being awake” or “enlightenment,” in which one’s mindfulness is so complete that one no longer feels trapped in a suffering and dying body but rather feels perfectly open to and accepting of the cosmos. Buddhists regard this state of mind as being present to “The Deathless,” which does not perish. Do humans and/or animals have an afterlife? 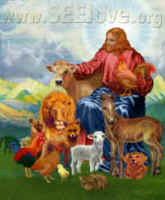 I do not think it is reasonable to believe that humans have afterlife and animals do not. Humans and animals have much in common at a genetic, physiological, and emotional level. Some have argued that only humans have a soul, yet the Hebrew Scriptures use the same word, nephesh, to describe the essence of both humans and animals. When relating to humans, translates have called nephesh "soul" (King James Version) or "being" (Revised Standard Version) (2:7), and they have translated the exact same word as "creature" for animals (2:19, KJV and RSV). Therefore, this common biblical basis for claiming that humans have souls while animals do not reflects translators’ biases, not the scriptures themselves. Many people with “near-death experiences” (NDE) relate an out-of-body conscious experience which has convinced them in an afterlife. However, it is difficult for those who have not had such experiences to evaluate NDE claims. I do not know what happens to the “I” (the stable sense of self that I carry throughout my life, which seems unchanged even while most of my body’s cells die and some are replaced). I think our fear of death – which relates to the destruction of the “I” – encourages us to envision some kind of existence after our bodies cease to function. Perhaps there is an afterlife, but, regardless of the fate of the “I,” our faith teaches us that faith in Christ does offer the possibility of eternal life.